The car industry has been behind the marketing curve for many years. The industry has failed to see the value of marketing, possibly because the marketing has failed them so many times. Auto repair shops need to communicate with their customers on a regular basis regarding promotions, service reminders, recommendations, and general information. This provides value to the customer, because it builds a long term relationship with the customer, reduces needless heavy line repair expenses, and increases profitability through loyalty and increased visits to the shop. Results must be measurable, through real time statistics, and increased profits for the shop owner. Mitchell 1 has made a huge impact on the Electronic Marketing Customer Retention (ECRM) industry. Mitchell 1’s program has a robust marketing system including marketing support, detailed reports, and eConnect. I can almost see your face right now… I lost you didn’t I? “What is eConnect?” It is an email matching service, for those automotive shops, 90% of you, that have not collected email addresses from their customers. Mitchell 1 obtains e-mails for your customers through a national database, so you can still use the system. In accordance with privacy and spam laws, you won’t be able to view the actual address, just the customer information. It is very important that you continue or start collecting emails from your customers to continue building your marketing database. Mitchell 1 stands out above CustomerLink and Mechanicsnet with an amazing commitment to customer satisfaction and robust reporting. A shot of honesty, the ECRM program will help you increase profitability if used alone, however, when used with an online presence, social media, and monthly e-Newsletters your impact will be much more effective. 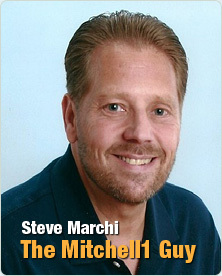 Contact The Mitchell 1 Guy today!